The eighth century dawned on a Greek world that had remained substantially unchanged during the centuries of stagnation known as the Dark Age. This book is a study of the economic and cultural upheaval that shook mainland Greece and the Aegean area in the eighth century, and the role that poetry (Homer and Hesiod) played in this upheaval. 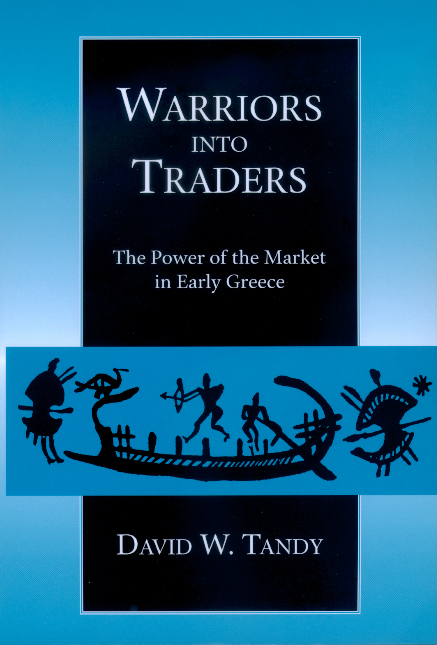 Using tools from political and economic anthropology, Tandy argues that the eighth century witnessed a great transformation of dominant economic institutions that involved wrenching adjustments in the ways status and wealth were distributed in the Greek communities. The economic organization of preindustrial societies, ancient and modern, can help us understand how the sudden shift in economic formations led to new social behaviors (e.g., new modes of burial and of building use, new forms of exchange) and to new social structures such as the polis. Unraveling the dialectic between the material record and epic poetry, Tandy shows that the epic tradition mirrored these new social behaviors and that it portrayed the stresses that economic change brought to the ancient Aegean world. The book moves from broad strokes to fine, from the Greek communities' emergence, in general, from the stagnation of the Dark Age to the specific plight of one (perhaps peasant) community, Ascra in Boeotia, on whose behalf Hesiod sang his Works and Days. The eighth century dawned on a Greek world that had remained substantially unchanged during the centuries of stagnation known as the Dark Age. This book is a study of the economic and cultural upheaval that shook mainland Greece and the Aegean area in the eighth century, and the role that poetry played in this upheaval. Using tools from political and economic anthropology, David Tandy argues that between about 800 and 700 B.C., a great transformation of dominant economic institutions took place involving wrenching adjustments in the way status and wealth were distributed within the Greek communities. Tandy explores the economic organization of preindustrial societies, both ancient and contemporary, to shed light on the Greek experience. He argues that the sudden shift in Greek economic formations led to new social behaviors and to new social structures such as the polis, itself a by-product of economic change. Unraveling the dialectic between the material record and epic poetry, Tandy shows that the epic tradition mirrored these new social behaviors and that it portrayed the stresses that economic change brought to the ancient Aegean world. Tandy brings in comparative evidence from other small-scale communities beset by changes, spotlighting the specific plight of one community, Ascra in Boeotia, on whose behalf Hesiod sang his Works and Days. The result is a lively, moving account of a human dilemma that, many centuries later, is all too familiar. David W. Tandy is Distinguished Professor of Humanities in the Departments of Classics and Anthropology at the University of Tennessee. He has translated, with Walter C. Neale, Hesiod's Works and Days (California, 1996).